We know that ZIP code matters for health – this is especially the case for children. The Child Opportunity Index tracks neighborhood factors that influence child health and development. The COI covers census tracts in the 100 largest U.S. cities, using data points such as fourth grade reading rates, proximity to childhood education centers and parental employment rates (also known as social determinants of health). We especially like COI’s interactive mapping tool, a way to easily see how opportunities vary within and across cities. Why We Like It: The index includes a wide range of contributors to health, so a single map paints a fairly complete picture of the risks and resources in a child’s neighborhood. 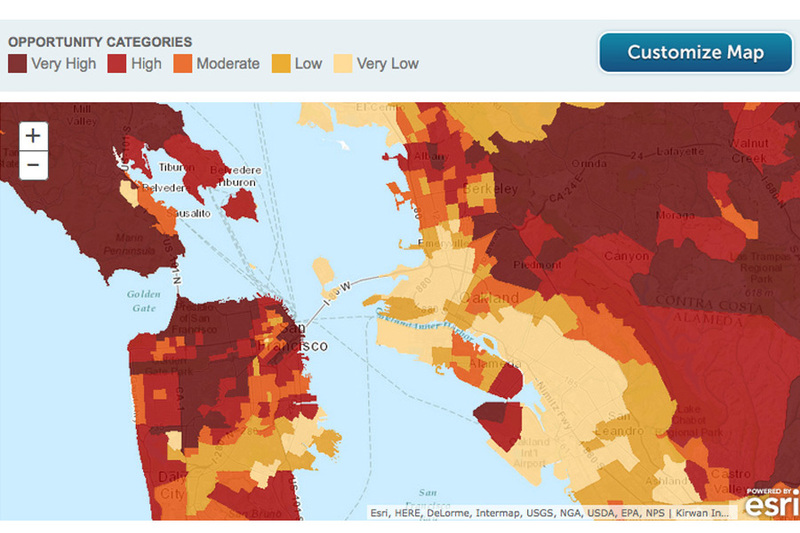 Where You Can Find It: Map child wellbeing in your city at diversitydatakids.org. Other resources: Read the Health Affairs article for using the COI for cross-sector collaboration, and also visit the partner site diversitydata.org. Check out PolicyLink’s webinar featuring COI and our own Colby Dailey. This map showing child opportunities in the San Francisco Bay Area was created by Renee Roy Elias.